#LightTheWorld this Christmas by serving your Visiting Teaching sisters and being a Lifesaver to someone. With this beautiful quote by Thomas S Monson, you can be sure to be Christ's hands this Christmas and help lift a sister up. 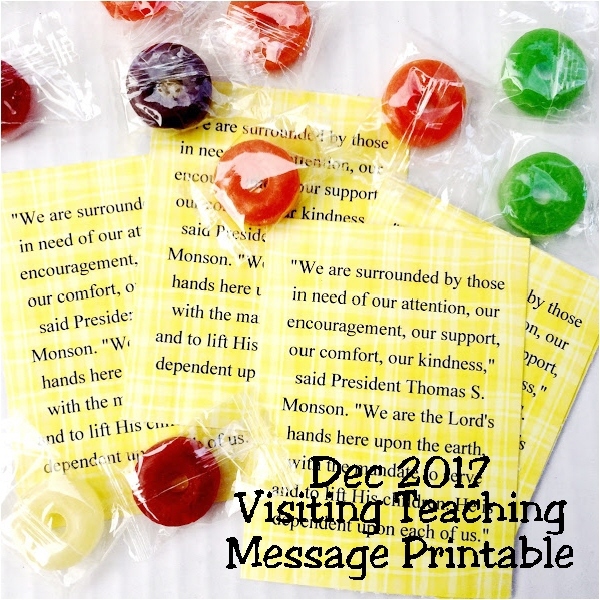 With the changes coming to the Visiting Teaching program, this could be the last visiting teaching message printable that I put out. I haven't decided how to keep doing this without a main message anymore. I have thought about doing a monthly "Thinking of You' message or "uplifting spiritual" thought, but I'm still unsure. Do you have any thoughts on how you are going to handle it? But I'm thrilled that we are going into December with thoughts of service and thinking about our fellow sisters. December is such a hard time for some and a great way to look to our sisters for both help and to find ways to help. With the LDS Church's emphasis on #LightTheWorld this Christmas, now is the perfect time to look for little acts of kindness and service you can do for those sisters whom you visit teach as well as those in your neighborhood and community. 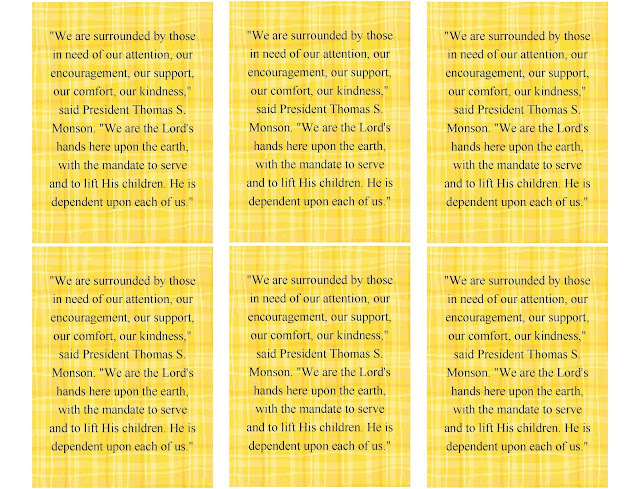 "We are surrounded by those in need of our attention, our encouragement, our support, our comfort, our kindness," said President Thomas S. Monson. "We are the Lord's hands here upon the earth, with the mandate to serve and to lift His children. He is dependent upon each of us." 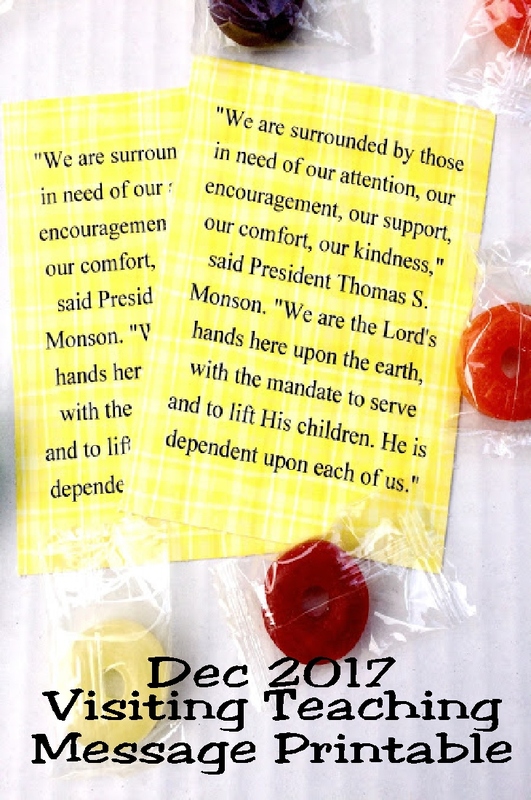 We are to be His hands and our fellow Sisters' Lifesavers. As you go visit these sisters this month, be sure to look beyond the lesson and look for ways to be a lifesaver to them. Sometimes there is a heart that's really hurting behind the "I'm Fine" answer. Really look. Really listen. Really act. To use this printable, simply click on the tags below to open the picture in a new window. Then right click to save it to your computer. Print it out on to card stock and cut into a tag. Add the tag to a bag of Lifesaver Candies and give with a great big hug.